From summer block­busters to famous corpo­rate turnarounds, the best comeback tales always focus more on heroes' bold, clever maneuvers than on the hours they lie awake at night obsessing over where they might have gone wrong (and how they can fix it). But according to Daring Way founder and CEO Brené Brown—the researcher and storyteller whose TED talk "The Power of Vulnerability" has been viewed 20 million times—a crucial opportunity exists in spending time with our failures. 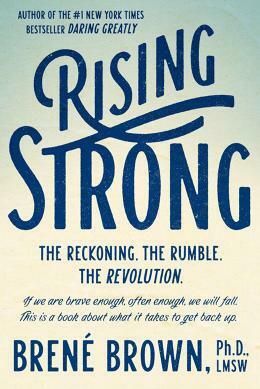 Her new book, Rising Strong, explains how it can even transform the way you lead. Here's why she wrote it. Brown—both as a professor at the University of Houston and as CEO of Daring Way, which trains counselors in her work—has spent 14 years studying the link between vulnerability and courage. In 2012, she set out to learn why some people grow from their setbacks while others "get stuck on the ground" or "fall around the same issues over and over," she says. Last year, Brown gave a talk at Pixar Animation Studios, where president Ed Catmull (who helped save Pixar with Toy Story) and his team explained that the middle of the creative process is the hardest part. In the script, for example, it's where the main character must face a tough journey to learn a lesson. That shaped her theory: You can't skip the second act. "People don't recount the middle of the story often," Brown says. "[It has] the most potential for shame. But it's where everything important happens." Brown analyzed data from more than 24,000 people in various professions and interviewed 2,000 others—from corporate executives to war veterans at West Point. She also plumbed her own experiences, including a marital squabble during a vacation. This led to a three-step process for leaders wanting to bounce back from adversity: Examine your emotions and actions ("The Reckoning"), confront the challenges that are holding you back ("The Rumble"), and write an ending to the story that will transform how you face future obstacles ("The Revolution").